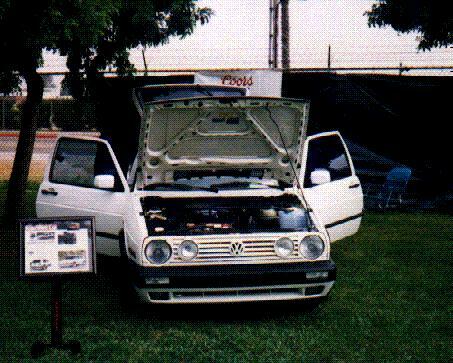 Here's a picture of my GTI at a VW car show in 1995 (note the magazine article on the display stand next to the car). My car was featured in the March 1995 issue of Eurosport Car Magazine, and was on display in two Volkswagen shows in Costa Mesa California. A scan of the magazine article as well as technical information on the extensive modifications I've done to my little German friend will be available on Nurmix Web Central soon. Take me back to Nurmix Web Central now! I can't take any more of this GTI crap!